On March 1, 2015, the College will host a celebration of our female alumni. Since first joining the campus in the 1970s, women have made their indelible mark here on the Hill and beyond. From valedictorians to class presidents, team captains to campus club leaders, female students have made our community even stronger, and continue to today. At the March Forward event, planned in honor of the bicentennial, we will celebrate all that our alumnae have accomplished both as students, and as leaders in their professions and communities. We hope that all alumnae will consider joining us. Registration is required. 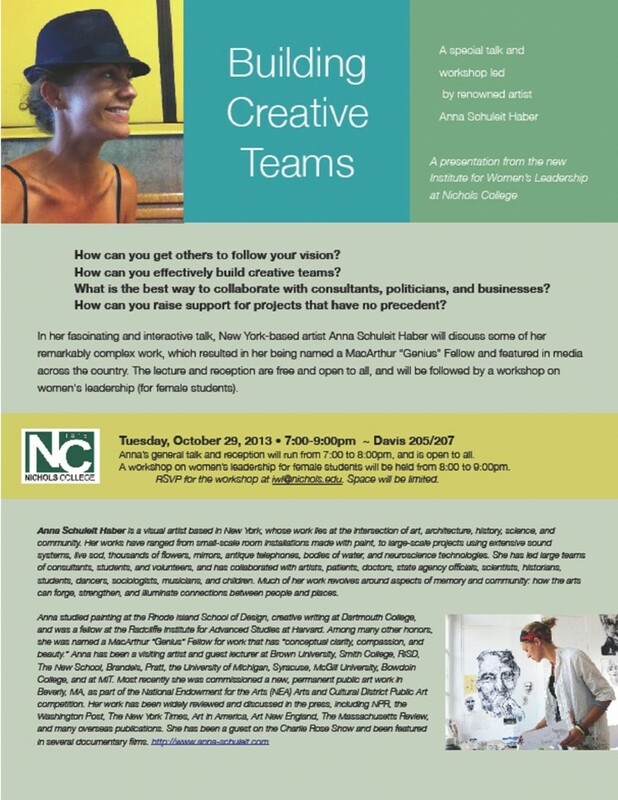 Public artist and MacArthur “Genius” Fellow Anna Schuleit Haber will present a talk on Leading Creative Teams in Davis Hall, 7-8pm on October 29, 2013 — open to all. Following the talk, Anna will also hold a workshop just for female Nichols students on leadership from 8-9 (to RSVP to the workshop portion, please email us at iwl@nichols.edu to reserve your spot). Please contact iwl@nichols.edu with any questions.